We got our solar panels for our boat which we live on, from Bimble they were so helpful, friendly and the advanced thet was great, if anyone is thinking of putting solar on there boat or home i would strongly recommend BIMBLE SOLAR. Voltage Sensing relay for modern engines with smart alternators for Euro5 and newer engines. Microprocessor control with 9 available programmes. Before using this unit please read these instructions carefully. Take special care to follow the warnings and safety suggestions listed below. Keep these instructions for future reference. There are no user-serviceable parts within the unit, refer servicing to qualified service personnel. 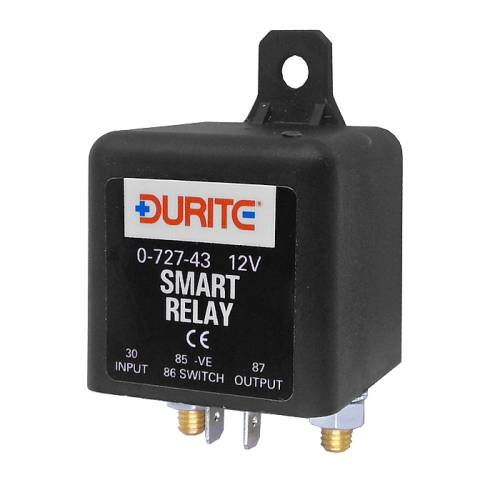 The Durite Smart Relay has been designed to be used with the latest range of vehicles fitted with smart alternators and regenerative braking systems. ln addition, there are 9 available programmes allowing the user to set the charging/protection voltages to suit their requirements. Therefore, the Smart Relay is suitable for use either for charging of a secondary/accessory battery or for protection of the main battery from a particular high drain circuit. Additionally, it has the facility for a manual override allowing both batteries to be used to start the engine or to make safe a piece of equipment on the protected circuit before power is lost. Connect terminal 86 through a momentary switch (not supplied) to terminal 30. When the switch is operated and the circuit is made the unit will make the connection between terminals 30 and 87 for 30 seconds from when the switch is released. To enter programming mode, the power must be off to terminal 30 and terminal 85 must be connected to ground or -0V. Connect terminal 86 to terminal 30 and then re-connect the power to terminal 30. The LED on the top of the unit will flash a number of times indicating the current programme number (once for 1, twice for 2, Etc.). Remove and replace, within 40 seconds, the connection to terminal 86 and the LED will start to sequence through the programme numbers (once for 1, pause, twice for 2, pause, Etc.). When the number of the programme required is reached remove the connection to terminal 86. The LED will flash the number of times to confirm the programme number selected. if this is OK re-connect terminal 86 and the LED will flash quickly indicating that the setting is saved. (if not OK turn the power off and start again.) Turn the power off. When the power is turned back on the unit will use the last programme set.